10 Reasons to say "Meet Me in Westchester"
Surrounded by the beauty of the Hudson River and Long Island Sound — and bordering New York City — Westchester County offers the best of both worlds: the serenity of the Hudson Valley with easy access to the excitement of the Big Apple. In fact, Fodor’s — the largest international travel publication — named the Hudson Valley Region to its “Go List” of the top 25 places to visit in 2015. 2) It’s Easy to Get Here By Air. Westchester County Airport (HPN) is located just six miles from the White Plains central business district and offers 50+ flights a day from six airlines. Plus three major airports serve the region — LaGuardia (LGA), John F. Kennedy International (JFK) and Newark Liberty International (EWR) — and host a combined total of 194 airlines. 3) It’s Easy to Get Here By Rail. The Metro-North Railroad, with service from New York City’s Grand Central Terminal, has three lines along the Hudson, through White Plains, and adjoining Long Island Sound, with 43 stations. And Amtrak adds another rail option, with stops in New Rochelle, Yonkers and Croton-Harmon. 4) It’s Easy to Get Around Once You’re Here. Westchester County’s bus system, the Bee-Line, serves over 30 million passengers annually and uses the MetroCard, the same payment system as public transportation in New York City. Arriving by car? Countless major highways criss-cross the County for quick access to all destinations. 5) Topnotch Meeting Facilities Await. Choose from over 35 venues with a combined 300,000 square feet of meeting space for your event. The many major corporations headquartered here demand smart meeting spaces and effective support services to address every business need — so our venues come prepared for any situation. 6) Select From an Array of Hotel Packages. Many of our group-friendly hotels offer special room rates, breakfast, welcome receptions, free and ample bus parking, luggage storage, complimentary rooms for drivers and early/late check in. More than 35 full-service and specialty hotels have a combined total of 6,500+ rooms that are ready to meet your customized needs. 7) Savor a Sumptuous Culinary Scene. 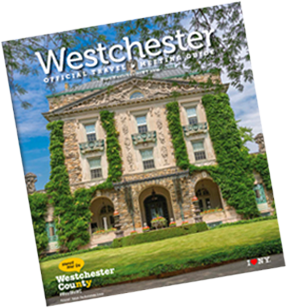 The Westchester restaurant scene gets rave reviews for its elegant waterfront establishments, sophisticated downtown dining spots, upscale international eateries and boffo burger joints. Many of the County’s award-winning eateries are also located near exceptional accommodations and popular attractions, making it convenient to sample their fab fare. 8) Choose From a Multitude of Experiences. Check out the different itineraries we’ve put together to help you get the most out of your stay, including Jazz and Soul Live Music, Tasting Tour & Picnic, Everything Old is New Again (antiquing), and Famous Families. For more, see www.VisitWestchesterNY.com/plan-your-trip/itineraries. 9) There’s Something for Everyone All Across the County. Wherever you stay, there’s plenty to see and do nearby. From outdoor experiences in Northern Westchester to upscale shopping in downtown White Plains, from harness racing in Yonkers to a hot dining scene in Port Chester, from scenic Hudson River towns to Playland’s 1920s “Dragon” roller coaster, the choices are endless. 10) Unique Options to Build Team Spirit. Quality time — it’s important for any team that wants to improve its effectiveness. Westchester offers countless creative ways to promote team-building cooperation and communication. Your group can herd sheep at Stone Barns Center for Food & Agriculture, hit the track for go-kart races at Grand Prix New York, or or feel the rush of indoor-skydiving at the new iFLY location in Yonkers.